Fearsome desert savages inhabiting the rocky Jundland Wastes, Tusken Raiders are the foremost reason Tatooine colonists do not wander far from their isolated communities. Extremely territorial and xenophobic, Tusken Raiders will attack with very little provocation. They show no allegiance to even their native world-mates, as these nomads have attacked Jawa scouting parties on occasion. They have even gathered numbers large enough to attack the outskirts of smaller towns like Anchorhead. 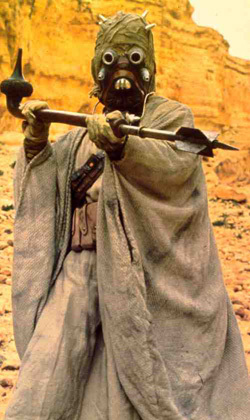 Covered from head-to-foot in tattered rags and robes, Tusken Raiders -- or Sand People as they are also known -- brandish a deadly bladed club known as a gaderffii. They also carry projectile rifles with which to shoot at passing vehicles. The male of the species tend to be the aggressors. Females can be distinguished by their elaborate jeweled masks with eyeslits and torso-covering sand-shrouds. 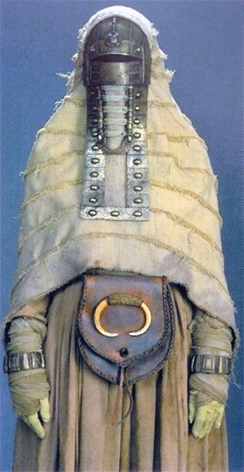 Tusken children wear unisex cowls and simple cloaks. For transportation, Sand People have domesticated the hardy bantha -- a longhaired spiral-horned quadruped also found on Tatooine. These nomads purposely travel in single file, to conceal their numbers. So dangerous are the Tusken Raiders that few xenobiologists are brave enough to venture close to them. What little information that exists on the nomadic brutes is often contradictory and incomplete. Indeed, there are those in official government positions that question the relative sentience of the Tusken Raider altogether. Alien-rights activists, however, believe that such claims are being made to justify the indiscriminate slaughter of the Sand People and the acquisition of their land. The current leading theory is that the Sand People are the descendents of the Ghorfas, a society that built caves within the cliffs of Tatooine. Their civilization collapsed when offworld settlers disrupted their water supply, leading to their current nomadic existence. Their origins - either native to Tatooine or transplanted - had been lost even to the Sand People themselves, although there were legends of a time when Tatooine was covered with grasslands. These legends held that the Builders - a group of Rakatan explorers - arrived on Tatooine and tried to enslave the ancient Sand People, who had discovered space travel and angered the Builders. They fought back and won their freedom, but the Rakatans burned the grasslands in retaliation, leaving Tatooine a desert wasteland. This story also claims that the root of the Sand Peoples' intense hatred of other beings derived from their war with the Builders, although written history points to a more recent event. Some 400 years before the attack on Fort Tusken, the desert bandit Alkhara slaughtered a group of Sand People who had befriended him. This was generally considered the source of the Sand Peoples' anger and mistrust. Tatooine colonists had already established a number of communities on the desert world before running into the Sand People. One such outpost was Fort Tusken, northwest of Mos Eisley. The settlers inadvertently constructed their fort on land sacred to the nomads. The resulting Sand People attack was brutal. The name Tusken Raider, along with their fearsome reputation and the Sand People-outlander tension were indelible outcomes of that bloody day. Tuskens live a strictly ritualized life. Among their sacred tenets is a rich oral history told by a venerated raider known as the storyteller. The storyteller must recount the detailed Tusken tradition verbatim at each telling -- it is considered blasphemy to botch a single word. Such a crime results in instant death and the appointment of a new historian. Tuskens travel in family groups of 20 to 30 individuals and their banthas. Tusken life is harsh and deadly -- as is the desert environment that bore them. Tusken youths are taught the dangers of desert survival at a young age. They must pass through an arduous rite of passage before being accepted as adults. Such trials could include hunting and slaying a krayt dragon or raiding an outlander camp. The strangest aspect of the Tusken Raider is the mysterious relationship with the bantha. The bantha and its rider are intrinsically linked, as if on a telepathic level. A tribe member who has lost his bantha is considered incomplete and an outcast. Similarly, when a raider dies, his mount becomes frenzied and suicidal. Such crazed banthas are set loose in the desert. Tuskens are strongly divided among gender lines. The females tend to the camps while the males hunt and fight. 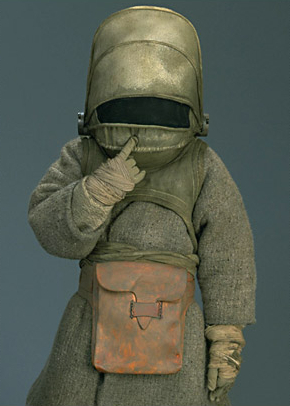 As children, Tusken youngsters -- called Uli-ah, wear unisex garments that conceal their entire bodies, making it impossible to visually determine the gender of a child. Once each year, all newly recognized adults are paired for life in a ceremony that involves the mixing of the blood of husband and wife, and their respective bantha mounts. Sheltered in a privacy of tent, the Tusken couple then slowly unwrap their bindings to see their true forms. Only their mate is allowed to know a Tusken's true appearance; an accidental glimpse of an unwrapped Tusken warrants a blood duel.